Christianity begins with the resurrection of Jesus of Nazareth. Church history begins on the Day of Pentecost. These Jewish Christians adopt a messianic theology and continue to follow the Law of Moses. Hellenistic Jews from all over the Roman empire were among the initial converts - conflict soon surfaced between the Palestinian Jews and the Hellenstic Jews. This represented the beginning of the church's struggle to reach out beyond it's original culture and race - the Great Commission. The Hellenized Jews failed to take the gospel to the Gentiles in any appreciable way. It took a special man, Saul of Tarsus, a Hellenized Jew, to aggressively take the gospel to the Gentiles. Saul becomes "the apostle Paul" and is attacked on every side: the Jews attack him, the followers of James attack him, and the Romans arrest him. In the early 60's, under Nero, the Roman government begins orchestrated persecution of Christians. By the 60's the Christian sect, especially under Paul, had separated from Judaism. In 62 AD both Peter and Paul are executed in Rome. Roman persecution will sporadically occur throughout the second, third, and the beginning of the fourth centuries. In the late 60's Jewish Zealots in Jerusalem rise up in rebellion against the Romans. Titus, son of the emperor Vespasian, commands more than 60,000 Roman troops to wipe out these Zealots. The Jewish Temple is burned to the ground in 70 AD. This event marks a critical point in the development of Christianity - the struggle of the Church against Judaism almost completely disappears. From 70 AD forward Christianity becomes mainly a Gentile dominated movement. Early gospel accounts had already begun to be circulated by 70 AD. Mark's gospel was probably written first, followed soon by the accounts of Matthew and Luke. Paul's various letters (written mainly from around 50-60) were also beginning to be circulated. Post apostolic writings that eventually do NOT become part of the New Testament canon attest to a growing negative attitude towards Judaism after 70 AD. By the close of the first century all the documents which are now contained in the New Testament had been written. The first century ended with the persecution under Emperor Domitian (81-96 AD). This is the historical backdrop for John's Revelation. The writer is urging fellow believers to stand firm against "Babylon," the Roman empire. Immediately after the resurrection, on the day of Pentecost, a new Jewish sect is firmly established. According to Acts a supernatural event takes place that draws a crowd of Jews who have made the pilgrimage to Jerusalem for the great festival. Something like "tongues of fire" appear on over 100 believers; Jews from all over the Roman empire hear the message of the gospel in their familiar language, then hear Peter preach, and a few thousand of them respond. This early sect of Jews continued to observe the Sabbath, but also meet together on the first day, Sunday, referring to it as "the Lord's day." These early Jesus followers were all Jews, many of them continued in strict observance of the Law of Moses. Even some Pharisees came to faith (Acts 15:5). Even though Luke gives us a picture of harmony in this primitive Church, he also gives some hints that it was not trouble-free. In Acts 6 we get the first sign of internal trouble. The Hebrew widows were being cared for while the Grecian widows were neglected. As we mentioned above, Jews from all over the empire had made pilgrimage to Jerusalem for the great festival of Pentecost and had witnessed the strange, yet supernatural events described by Luke. Many had trusted in Jesus as the promised Messiah and made the decision to stay in Judea rather than make the trek back home (it is possible that these early believers were waiting for the apocalyptic return of Jesus). Large numbers of Jews lived outside Palestine in the first century. These are the Jews of the Diaspora, the "scattering," or "exile" of the Jews throughout the Greek world - first in 722 BC when the Assyrians conquered the northern kingdom of Israel, then in 588 BC the Chaldeans conquered the southern kingdom of Judah. The victors in both instances forced the Jews to be relocated, thus diluting their national and cultural strength. Over the next few centuries the Hebrew language was neglected and forgotten by these exiled Jews. Most diaspora Jews of the first century spoke Greek. In fact, sometime in the third century BC the Jewish scriptures (Old Testament, OT) were translated from Hebrew into Greek so that these Greek-speaking Jews could hear and understand the Law of Moses. This famous translation is known as the Septuagint (or LXX), a reference to the legendary story that 72 scribes translated the various texts in a 72 day period with a divinely inspired perfection of agreement. These Jews of the diaspora were referred to as "Hellenized" ("Greek influenced") by the politically important, Hebrew-speaking Jews of Palestine. Palestinian Jews despised these Hellenized Jews, believing they had compromised their religion. They could not speak Hebrew, God's language, nor could they understand the Law of Moses when read in Hebrew. When Hellenized Jews came to Jerusalem they were urged to attend Greek speaking synagogues so they could hear and understand Moses being read. They were not wanted in the Temple. We know that the Jews hated Samaritans, and were not fond of Gentiles. Luke tells us this prejudice found its way into the primitive church - Hellenized widows were being neglected. "Palestine" is not a biblical term, but was a Greek term used by Aristotle, Plutarch, Herodotus, and Philo to refer to the region that included Judea. See my response to this criticism, Palestine in Ancient History. According to Luke, the apostles solve this problem by appointing seven men to new leadership positions. If you look closely you will find that these men are all Hellenized Jews. The apostles apparently realized that the minority class needed representation in the leadership of the church. In the next chapter we find Stephen (one of the seven deacons) preaching aggressively against the Jewish leadership and, more importantly, against Temple worship. Hellenized Jews living outside Judea were forced to find a more spiritualized way for obeying the Law of Moses since they did not have access to the Temple nor to the sacrificial system. This spiritualized Judaism is attested to in the writings of Philo of Alexandria and in the writings of the Qumran community (The Dead Sea Scrolls). In the next few chapters of Acts we see these Hellenized Jews taking the gospel to Samaritans, Ethiopians, and other non-Palestinian Jews. The Great Commission is being extended, but it should be noted that non-Jews continue to be excluded by these Hellenized evangelists (Acts 11:19). It takes a special person to push the infant church outside the Jewish boundaries - Saul of Tarsus is that person. According to Acts, a young man named Saul was present (and may have had been in charge) when Stephen was stoned. Acts gives an account of this man as he travels through the region "breathing threats and murder against the disciples of the Lord" (Acts 9:1). Saul embodies the earliest opposition to the primitive church as a Jewish sect. The radical view that Jesus was the promised Messiah, coupled with the anti-Temple worship preached by the Hellenized Jewish believers, gave rise to a militant opposition. It appears that some of the existing Jewish leadership made an attempt to stamp out this new sect and Saul appears to have been a leader in this movement. We know this man as the apostle Paul, author of 13 letters within the New Testament (NT). Saul, who later changes his name to Paul, is himself a Hellenized Jew. Paul reveals very little of his biography in his writings; it is the account in Acts where we learn that he grew up in Tarsus (northeast of Syria) and was later brought to Jerusalem for his education. One important piece of evidence pointing to Paul being a Hellenized Jew comes from his quotations of the NT - his text is the LXX rather than the Hebrew version. In his own words, Paul tells us "I was violently persecuting the church of God and was trying to destroy it" (Gal. 1:13). On his way to Damascus he was confronted by the risen Jesus in a heavenly vision. According to the three separate accounts in Acts, Saul found himself on the ground, blinded by the intensity of a heavenly light. The risen Jesus gave Saul a commission to "be a light to the Gentiles." 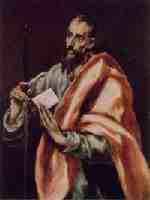 This Saul was to propel the infant church to fulfill the Great Commission by taking the gospel to the Gentiles. According to Paul he immediately went to Arabia where the risen Jesus taught him "by revelation" for the next 2-3 years (Gal. 1:11-18). This appears to be a wilderness experience, following in the OT tradition of Moses and Elijah, where Paul receives and attempts to understand his calling. Paul says that the leadership in Jerusalem recognized this calling and gave him "the right hand of fellowship" (Gal. 2:9). In Acts 13:1,2 Luke recounts the missionary commission of Saul and Barnabas by the church in Antioch. In this account their initial missionary focus is primarily on the Jews. Only after repeated rejection do they announce that they will turn to the Gentiles. Once they make this decision the intensity of persecution increases. Where does their opposition come from? The Judaizers, a sect of early Jewish believers, wanted Gentiles to be circumcised and to follow the Law of Moses. To understand Paul's letters you must first understand that his entire ministry is forged in conflict. Luke gives us an overview in Acts that shows Paul and his companions being opposed in almost every city, many times being attacked and chased out. Who is opposing Paul? We begin to get an idea of Paul's opposition in Acts 15:1-2, and 5. There are Jews, some Pharisees who have believed, demanding that the Gentiles be circumcised and obey the Laws of Moses. Paul rejects this position and continues to reach Gentiles without pushing the Law on them. For the remainder of the Acts record he is chased, beaten, and slandered by Jews. Luke seems to describe these merely as Jews, which leads the casual reader to assume they are persecuting Paul in the same manner as he himself had done as Saul of Tarsus. But when Paul's writings are carefully studied it seems that he describes his primary opposers as pseudo, or false brothers. In Galatians Paul is on the attack against those who have led Gentiles to circumcise themselves and place themselves under the Law. In Gal 2:11ff he relates an important story of when he confronted Peter over a similar issue. Peter had been sharing table fellowship with Gentiles until "certain men came from James." Paul is referring to James, the brother of Jesus. This is the same James who speaks out and seems to make the final decision at the Jerusalem Council in Acts 15. This group of early Jewish believers is often referred to as "Judaizers." Why is this important? Paul refers to this struggle he has with this group in at least five of his letters; thus, to properly read and understand Paul one must recognize the historical backdrop in each Pauline epistle. How prevalent is this issue? Here are the letters with the most important texts highlighted. Mark my words. I, Paul, tell you that if you let yourselves be circumcised, Christ will be of no value to you at all. Again I declare to every man who lets himself be circumcised that he is obligated to obey the whole law. You who are trying to be justified by law have been alienated from Christ; you have fallen away from grace. Paul's most animated words come in this letter in 5:12. This is a unique letter for Paul in that he has not yet been among this congregation. He is writing this letter to make sure his ideas are clearly presented to the Romans rather than having his opposers misrepresent him. In 14:14-23 he gives his clear stance on unclean meat, one of the issues where he is not in agreement with the decision of the Jerusalem Council. Paul was commissioned by Jesus to be the apostle to the Gentiles. Peter and James recognized that calling (Gal. 2:9), and Paul aggressively pursued his calling even though it cost him greatly. The Acts account seems to indicate that the primitive church was not effectively fulfilling the Great Commission until the apostle Paul came on the scene. By the middle of the second century the Christian Church was primarily Gentile. This is what led to the Jerusalem Council, the first known formal gathering of the most strategic leaders in the Church. The issue is to define the expectations for the growing Gentile church. According to Luke, Peter reminds the Council of how God had used him to bring the first Gentiles into the fold. Then Paul and Barnabas shared some of their stories. Next James speaks. Outside of some vague references in the gospels and one quick reference in Acts 12:17, this is the first mention of James, the brother of Jesus. Yet it seems that James is in charge rather than Peter, the "rock." It is James who states the decision of the Council: Gentiles would be expected to avoid three types of unclean meat, and to avoid sexual immorality. The reason for this discussion on James, Paul, and the Jerusalem Council is to understand the struggle of the early church with respect to the issue of the Gentile believers. The first Christians, and the initial leadership, was Jewish. By the late 50's Paul's evangelistic reach into the Gentile world had grown to such an extent that Christianity was becoming more Gentile than Jewish. It was Paul's custom to appoint leadership in each church when he left for his next destination. As Paul's Gentile churches grew in number, the leadership base grew and the Jewish leadership in Jerusalem probably felt their influence diminishing. In addition to the Pauline outreach there are indications that the gospel was spreading outside immediate apostolic influence. There is no clear record of an apostolic visit to Rome, yet Paul writes a letter to the Romans addressing what appears to be an already stable community with Jewish and Gentile believers. In Acts 18:24-25 a man named Apollos appears on the scene with "a thorough knowledge of the Scriptures. He had been instructed in the way of the Lord." He needed some teaching concerning the Holy Spirit, but appears to have clearly understood the gospel of Jesus. [Read about the theory that Apollos was the author of New Testament Hebrews] Early tradition recorded in the fragments of Papias tell us that Mark, the cousin of Barnabas, had taken an early copy of his gospel to Egypt. Another tradition says that Barnabas and Mark actually preached in the streets of Alexandria. These traditions may have been attempts at explaining the Apollos text, but are certainly not impossible. What is clear is that the missionary outreach of the church had taken hold. In Acts 21 Paul visited Jerusalem again to present a financial offering from the Gentile church to the Jerusalem church. Paul meets with James, and in a strange turn of events is arrested (Acts 21:18-36). Paul learns of a plot to kill him and appeals to be handed over to the Romans. The remainder of the Acts record follows Paul on his way to Rome as a prisoner, ending with him in Rome under house arrest, waiting to appear before Caesar. According to early tradition found in the writings of Clement of Rome, Paul was apparently released from this imprisonment and made his way to "the extreme limit of the west" (1 Clement 5.15). This could be a reference to Paul's stated desire to take the gospel to Spain (Rom. 15:28). It appears that Paul was released from his imprisonment in Rome, traveled west and was arrested again. It was during this second Roman arrest that Paul writes the Pastoral Epistles (1 and 2 Timothy, and Titus). Only a few years later the radical Jewish fringe led a revolt against Roman control. Nero sent general Vespasian to crush the rebellion. Vespasian dispatched an army of approximately 60,000 soldiers that methodically went through northern Judea restoring order as they went. Some Jews in the insurrection surrendered and were executed by Zealot leaders. The Roman "invasion" came to a standstill at the capital city, Jerusalem. The Romans laid siege to Jerusalem establishing an encampment completely encircling the city. Anyone caught trying to escape was executed, sometimes by crucifixion, and hung on the city wall for all to see. Nero committed suicide in the midst of a Senate takeover and Vespasian was recalled to Rome where he was installed as emperor. Titus, son of Vespasian, was left in charge of gaining victory in the Jewish revolt. Jerusalem was sacked and the Temple destroyed. Most of the Jews in Jerusalem were killed, committed suicide, or fled. These events were recorded in detail by the Jewish historian Josephus (War of the Jews V-VII). The death of James led to a dispersing of Jewish believers from Jerusalem and a weakening of the Jewish Christian community. The destruction of the Temple, with the consequent end of the Levitical priesthood and sacrificial system, brought a virtual close to the Jewish religion. There was a continuation of the religious observances, but it was a mere shadow of what had existed before. Another apparent result of the demise of Judaism and their historic Temple was a growing rift between what was left of the Jewish faith, including the early Jewish Christians, and the now dominant Gentile community of believers. This is most clearly seen in John's writings, especially in the Gospel of John, which includes confrontations of Jesus with the Jewish leadership not seen in the other gospels. John's writings also contain the clearest language and texts pointing to the deity of Jesus and his co-equality with God the Father. There is another set of early Christian writings that show us this continued movement away from first century Judaism. These writings are referred to as "The Apostolic Fathers." Although a slightly confusing designation, these are documents written by the first generation of Christian leadership after the apostles, thus the term "fathers." These documents give us a glimpse of how the ist century Christian churches continued to develop after the account in Acts. The Didache is a very interesting first century document that does indeed allow us to see how the ist century Christian churches were organized and how they may have been governed. It is important to know that this document represents the Jewish Christian churches more than it does the Gentile churches, but it is still instructive. The Didache is something of an early Minister's Manual. It gives very practical guidelines for baptism, fasting, prayer, the Lord's Supper (the Eucharist), and how to take care of traveling preachers and prophets. For now I will simply pull a few examples and leave the discussion of these writings for another chapter. Right now the important item to notice is the negative attitude directed at the Jews. There will be more discussion on this set of writings, "The Apostolic Fathers," in chapter 2. For now we will move on in our survey of the first century. The most commonly asked question directed at me when I speak on university campuses or in churches is, "How was the New Testament formed?" Because the church has always believed that the documents found in the NT are "inspired" writings and the most important source documents for the life, death, and resurrection of Jesus Christ (and Christian doctrine), this is not only a good question, but a critical one. Although these criteria sound reasonable, one cannot find a clearly described methodology like this in the patristic writings. Many early writings were accepted as inspired by some church fathers, yet failed to meet one or more of these conditions. I believe Tenney must have also mentioned that the canon was confirmed at a church council - this point stuck in my head for years and many people have echoed this belief over the years. In fact, the exact list of NT documents was confirmed at the third Synod of Carthage (397 AD), but this was only a regional council and by this time the 27 NT documents had already been agreed upon by most of the church...but there were some exceptions. The NT was NOT dug up in a farmer's field as golden plates like the Book of Mormon. The NT canon developed, or evolved, over the course of the first 250-300 years of Christian history. If the NT had been delivered by an angel, or unearthed as a complete unit it would not be as believable. Part of the historical validity of the NT comes from the fact that we can trace its development, albeit not as precisely as we might like. I will attempt to trace this development from the introduction of the gospels to the highly disputed Revelation of St John. I intend to do this in several parts, along with the content of the first four centuries, so you can "see" this development within the proper historical context. Oral tradition was the normal mode for communicating the teachings of a master in the ancient world. For one thing, before the use of papyrus was widespread writing was both clumsy and expensive. Using a stylus on a clay tablet worked, but once the clay dried no "corrections" or "edits" could be made. Writing on a scroll made of an animal skin was certainly an improvement, but was still limited. The widespread use of papyrus for the ancient world was like the coming of the internet in the modern world - a virtual explosion of written communication began. Irenaeus (A.H. V.33,3-4) quotes another passage from Papias where the author tells us that he knew the apostle John. This represents one of the earliest references to an early oral tradition within Christianity - Papias is writing down what he remembered hearing from the mouth of John, Polycarp, and others - so he is writing down oral tradition. This citation is especially interesting since Luke, the author of Acts, does not record this saying in his own gospel. In fact, this agrapha, from the Greek word "unwritten," does not appear in any of the four canonical gospels and is a witness to the sayings of Jesus being transmitted in an oral tradition. Many Christian scholars disagree with the theory that the sayings of Jesus were initially transmitted in an oral tradition. The concern is that this would threaten the integrity of his message, and thus threaten the validity of the gospel tradition. This section of how the NT was formed is more problematic and it should be remembered that the task for the historian is to present the evidence as objectively as possible, always acknowledging that we are working with theories of events that happened 2,000 years ago for which we do not have ALL the evidence. Probably as early as the late 40's the oral traditions that carried the words of Jesus began to be put into writing. This probably happened in order to protect the integrity of the message, to keep only 'authoritative' sayings intact. The Nag Hammadi texts seem to shed light on this phase of the gospel development. The Nag Hammadi Library, is a collection of thirteen ancient codices containing over fifty texts, discovered in the Egyptian desert in 1945, sealed in a large clay jar. The story of this discovery is the stuff of an adventure novel and can be found in summary form online at www.answers.com - the full story is found in the introduction of The Nag Hammadi Library in English by James Robinson (pp.22-24, rev.ed., HarperCollins Paperback, New York-1990). Jesus said, "This heaven will pass away, and the one above it will pass away. The dead are not alive, and the living will not die. In the days when you consumed what is dead, you made it what is alive. When you come to dwell in the light, what will you do? On the day when you were one you became two. But when you become two, what will you do?" It is likely that the early leaders began to hear odd sayings like this one and determined that an authoritative set of sayings needed to be recorded. Most scholars believe that Mark's gospel was the first of the four NT gospels written, followed by Matthew and Luke. The dates given vary widely from the early 60's (for Mark) into the 80's (for Luke). The difficulty with dating comes from the fact that early writers, like Paul for example, do not quote from any of the four gospels. Clear quotations do not begin to appear until the early second century. Even more liberal scholars would not suggest a second century date for the synoptic gospels, thus the lack of quotations are attributed to a slow pace for copying and circulating these documents. Papyrus does not become widely and commonly used outside the Egyptian region until the second century...and that is where our discussion of the NT canon will pick up. Jesus was a first century Jewish man preaching his message to first century Jews. The first 15 years of this new "Jesus movement" was basically a Jewish sect called "The Way." Racial tensions had existed within Judaism and found their way into this new movement. These tensions increased when Saul of Tarsus comes on the scene and aggressively takes the gospel to the Gentile world. From the record in the NT, even the apostles had conflict. Leaders in the church cannot live under a false expectation of unity all the time. We are called to live in unity, yet we cannot force this on others. As individuals we must be committed to doing our part. Leaders must embrace the humility of admitting when they have been wrong, and quickly forgive others. In 66 AD Zealot Jews attempt to throw off Roman rule. The Romans descend on Judea, laid siege to, and overthrows Jerusalem in 70 AD, burning the Temple to the ground. Christianity had been just another Jewish sect, but now begins to break away from Judaism to become a Gentile dominated church. In this period of transition, partly due to doctrinal differences, the Gentile church takes on an anti-Semitic tone. God calls us to reach the lost and to guard the church against false doctrine and moral laxity. Leaders in the church must be faithful to the gospel, but must be careful not to win the battle and lose the war. No person, no denomination has perfect doctrine or a perfect understanding of the biblical text. Somehow we must hold to the essentials, yet allow love and grace to reach out through us. The non-essentials should not hinder the unity Jesus prays for in John 17.